We like to think that the VBFS Library is a haven for our entire community. With a collection of over 20,000 books paired with digital and electronic resources - our students and their families are encouraged to freely use our facilities to become more informed and ethical users of information. At any time, you'll find students, families and faculty members reading, studying, working on a group project or even playing a game of chess or quietly working on a puzzle. Our library is open to the school community every day during school hours and often in the evenings for book author visits and other special events. At Friends, we believe technology enhances the learning experience and offers students new ways to communicate, collaborate, and create. 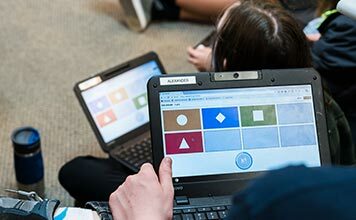 We integrate technology into every classroom in a way that augments teaching and learning to provide opportunities that reach well beyond our campus. We strive to create a culture of responsible use that continuously raises awareness of the positive, and negative, roles technology can play in our lives. Students in grades K through 2 have access to classroom iPads and use them in a variety of ways to enhance learning. Students in grades 3 through 12 have access to Chromebooks on a 1:1 basis. All divisions learn about the ethical and respectful use of technology, with the goal of becoming responsible digital citizens through exploration, discussion, and adherence to Quaker values. Summer is the perfect time to chill out with a good book. The Public Library is an excellent resource for all your reading and other materials. In addition to traditional reading materials, you will find continually changing audio materials, perfect for sharing while you’re traveling, and digital materials, great if you want to travel light. Our local Libraries also have great summer programs for all ages so take a minute to check them out! Outstanding picture books primarily for younger readers. Outstanding books for elementary and middle grade readers. Outstanding books by African American authors and illustrators of book that demonstrate an appreciation of African American culture and universal human values. Outstanding books by Latino/Latina writers and illustrators whose work best portrays, affirms, and celebrates the Latino cultural experience. Outstanding books that exemplify literary excellence in young adult literature. Have a great summer and happy reading!